Hello everyone and happy April! It’s finally officially spring, we are finally starting to see the weather turn for the better, and it’s Easter weekend. It also means that it’s time for another ScrapMuch? Sketch-y Friday Team A Reveal! It’s a short and sweet post for me this week. Since my last reveal I’ve been fighting a horrendous cold (among other things) and it’s still lingering. Thankfully I’m at least on the mend and the worst is hopefully behind me. I also mentioned in my last reveal that I was traveling, and I’m happy I managed to scrapbook some photos from that trip for this layout thanks to my amazing Canon Selphy. I love love love being able to print awesome pictures at home. I took an impromptu 3 day 2 night trip to Las Vegas to get a little bit of sun and warm and escape the cold and snow. I also took some time to spoil myself at the amazing spa at the Mandarin Oriental hotel after the extremely difficult losses of Socks and Matisse. A dear friend who has been through some difficult pet loss of her own suggested I needed something to look forward to for me, and this was absolutely perfect. Every visit to the Mandarin Oriental spa starts with the shoe exchange ceremony where they take your shoes and bring you spa sandals, symbolizing leaving your past and cares behind. The exchange is also accompanied by some amazing mint tea and a refreshing cool facecloth. The decor in the spa is as expected, understated and elegant. Each time I’ve gone to the spa I’ve booked a treatment at the Chinese Foot Spa. Whenever I go to a new spa I like to try their specialty, or something that is unique to them that I can’t get anywhere else. From their spa brochure: “It is the highest honor in many Eastern cultures to wash the feet of their guests. Inspired by the foot spas of the Far East, guests will receive an authentic foot treatment including a steeping hot foot bath infused with invigorating or relaxing herbal blends. After the ceremonial foot bath, guests are escorted to private reclining lounge chairs with majestic views of Las Vegas Boulevard. Detailed massage movements which focus on reflex points in the feet and lower legs provide a great way to recover from long walks on The Strip.” Speaking of long walks on the strip, my Jawbone UP24 I was averaging 8 miles a day during that whirlwind trip. So my psyche and feet earned that relaxation!! I think the look on my face in the selfie pretty much says it all. Just an amazing spa. A total treat. 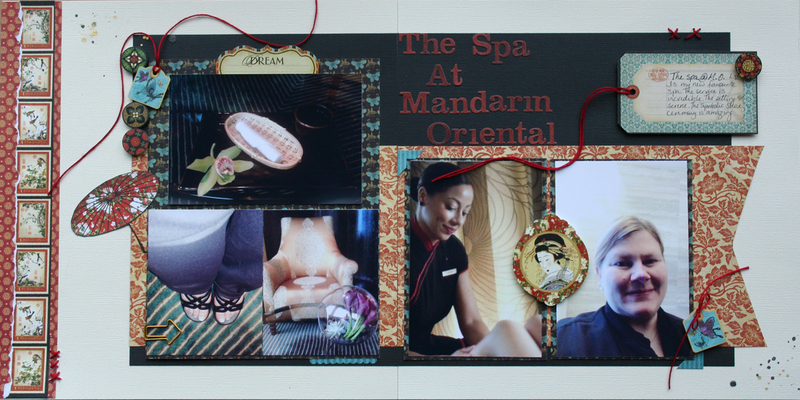 I’ve been lucky to visit many incredible spas in my life, and Mandarin Oriental is the best of them all. On a scrappy note, I’m happy I got to use up more of my Graphic45 Birdsong paper pack. It seems to be lasting forever and I got to a point where I was bored of looking at it. 2 years later it was fun to work with again and I don’t have much left now. I also admit I “borrowed” a picture from their website to make the sketch work – but it was also a perfect reminder of the foot treatment. I’m also guilty of not using my letter stickers enough, so it felt great to use a bunch of them long lingering in my stash. So now it’s your turn! Head on over to the ScrapMuch? blog and see what the rest of Team A created for this week. Then, create your own layout and link up for a chance to win an awesome ScrapMuch? prize! I’ve absolutely loved the amazing submissions we’ve been getting! Have a wonderful Easter weekend everybody! The spa looks AMAZING…..as is your layout! Love Graphic 45! You used it perfectly! Glad you had some “you” time! Wow the spa sure looks interesting and very culturally. Your layout is interesting! Great take on the sketch! Love that you wrote a journal on a tag. Fabulous page, love the choice of papers and accents for these photos!